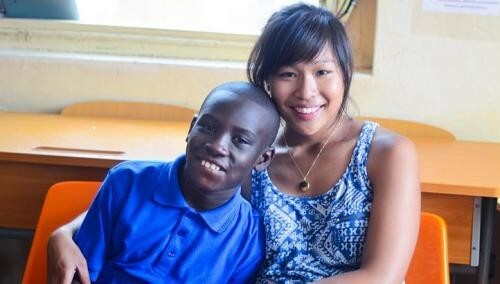 A solo trip to Ghana inspired Ms Woo Wan Fong to start a fund-raising campaign to improve the lives of people there by equipping them with skills. The 22-year-old went to the African country to volunteer at a centre for people with autism in June. Two weeks after she returned from the trip, she set up The Ghana Initiative, which aims to help the needy there by buying sewing machines and building an arts school. Ms Woo, who is in her second year at the University of Cambridge studying politics, psychology and sociology, is among the Public Service Commission (PSC) scholarship holders who take part in community work. "I want to inform people about the over-abundance we currently live in and how we can do without most of it," said Ms Woo, who went to Tanjong Katong Secondary School and Ngee Ann Polytechnic. She also volunteered with the Young Men's Christian Association of Singapore and Nature Society (Singapore). In an open letter published recently on the PSC website, PSC chairman Eddie Teo underscored the value of having diversity in the public service. PSC scholarships are seen by the public as a pipeline for future top senior civil servants, but there is a perception that they are given mainly to students from top junior colleges and many of the recipients tend to be "elitists" and out of touch with the community. But more polytechnic graduates have been awarded the scholarships. There were five this year alone, compared with nine between 2007 and 2012. Scholarship holders are given opportunities to understand the challenges and issues facing Singapore and Singaporeans, said Mr Terence Chia, director of the PSC Secretariat. They go on learning journeys to various community groups to better understand concerns on the ground, he added. "The PSC encourages scholarship holders to initiate or contribute to community service projects on their own," he said. Ms Loy Sye Yuet, 23, another PSC scholarship holder, is also active in community work. She started a project this year to raise awareness of children here who have been sexually abused. She said: "I took an interest in child sexual abuse in Singapore after reading about discussions on this issue in other countries. It is important to champion this issue as many Singaporeans are reluctant to admit its existence." Ms Loy, who has a degree from the London School of Economics and Political Science, is now in her second year of a master's degree course in governing the large metropolis at Sciences Po in France. Scholarship holders said volunteering prepares them for making policy decisions in the future. Said PSC scholarship recipient Yeo Han Liang, 23, who studied engineering and economics at the National University of Singapore: "Helping the less privileged gives me an opportunity to interact with them and learn about their struggles on a more personal level. It helps me develop empathy." But MP Denise Phua noted that community work and service learning projects should be done over a long period of time for one to fully understand the needs of the disadvantaged. She pointed out that not all students from the top JCs are elitists, but when "young people study and mix with others who are very similar in profile", they may be less inclusive. "There needs to be a deliberate curriculum design to ensure opportunities for students of different backgrounds and abilities to interact on a daily basis, not ad hoc."